The LTT bound Matsyagandha was running late by 30 minutes, and arrived only at 0545. WDM3D #11112 of Erode did the honors on this train. It was still dark, and i decided to take a short break and headed straight to the one and only canteen at PNVL station. Had a cup of hot tea while the freight action was going on strong! There were three freight trains standing ready to head out (2 to JNPT, and 1 to the opposite side). One of those rakes was operated by "Hind Terminals" and was operating a scheduled trip from Whitefield to JNPT. The loco incharge was WDG3A #13308 of Kalyan. The rake returns in the evening according to the Hind terminals website! While sipping the piping hot tea, I saw a loco entering Panvel from the Roha side with a short train. I quickly finished off the tea, and rushed off to check what it was! The train stopped on Platform 3. The loco was WDM2 #16877 of Ernakulam, and the load was two coaches - one inspection car, and one SLR. Both from KR! Platform 2 had a similar train! The loco here was WDM2 #18345 of Kalyan, and the load was a single inspection car with "NR" markings! The loco has a marking "inferior" on it. The loco later went out, and shunted out the SLR coach from the "KR" rake. Announcements were being made that the Jan Shatabdi would arrive on Platform 1. I decided to head out of the station, and rushed to a flyover right outside the station on the Diva side. Just as I reached there, the Ernakulam loco was seen shunting around with the Inspection car. In the meantime, WDM3D #11171 of Erode had arrived with the Madgaon Jan Shatabdi. I decided to remain there and see the passengers too. 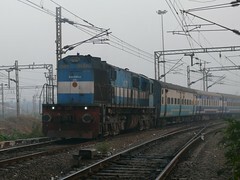 The first one to reach was the KR5 passenger - WDM2 #17108 of Ernakulam was in charge. It appeared that some link mix up had happened there, else this loco should have been on her way to ERS today! Just a while after KR5 reached the station, WDG3A #14981 of Kalyan pulled into Panvel with the Roha-Diva Passenger. Just as I clicked the loco moving out of Panvel, I noticed that points were being set for a train to arrive on the Main line. I decided to wait for some more time - that was WCAG1 #21981 with a Container train! I decided to call it a day, and headed back home!